Heat pumps are going on to play a key-role in future energy systems. The energy turnaround in Europe will focus electricity also as source for heating systems (compare (energie-experten.org, 2016)). The very low investment costs for such systems will lead to a revival of the electrical heating especially for very energy efficient buildings, whether new or renovated buildings. However, one of the main goals of the energy turnaround is to save energy. To reach these goals, i.e. to compete against direct electrical heating systems, very cost-effective and plug-and-play solutions for heat pumps need to be developed. One solution for this problem are exhaust air heat pumps. Energy efficient buildings are using a ventilation system with heat recovery (see Figure 1). The heat recovery cannot recover 100% of the ventilation losses, so the exhaust air still contains a lot of energy. In addition, the ducts that are necessary for the ventilation system could be used to distribute space-heating power. 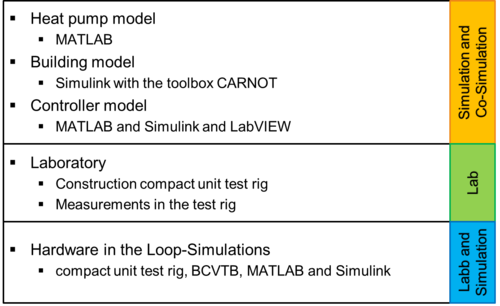 Figure 2 shows the concept of an exhaust air heat pump. The remaining energy in the exhaust air is used with an evaporator of a heat pump that heats up the supply air to provide the heat power to the building. This concept is well known and had been proved already many years ago. One commercial application are e.g. so-called compact units, which additionally use the heat pump to also heat up a small domestic hot water storage (compare (Bühring, 2001)). The main advantages of this system concept are the relative high source temperature, which is quite independent of the ambient air temperature, and the combination with the anyway necessary ventilation system. However, the limitations of these systems are well known. The available energy in the exhaust air is limited, because of the limitation to the airflow rate needed to provide good indoor air quality. A high heat load leads to low evaporator temperatures and therefore to low efficiency. The volume flow of the ventilation system is limited to the hygienic air exchange rate because increasing the volume flow would lead to dry room air in winter and this can cause health problems (Rojas, 2015). Without an additional higher ambient air volume flow (mixed with the exhaust air), the performance can be lower than for a single ambient air heat pump. The temperature of the supply air is also limited to around 55 °C to avoid a carbonization of dust (which leads to a bad smell) (Margreiter, 1987). This forces a limitation of the heat power provided by the supply air to around 10 W/m², which is also used for the definition of a Passive House (Passivhaus Institut, 2016). Moreover, the high temperatures of the condenser lead to a worse performance of the heat pump. A possibility to get rid of these problems is to use secondary air for the evaporator and/or condenser. Within the project SaLüH! (Universität Innsbruck, 09/2015-08/2018) a small heat pump with a speed-controlled compressor combined with a mechanical ventilation system with heat recovery is developed. The system will have a heat power of approximately 2.5 kW. To reach this high power additional ambient air will be used as source. Additional to the supply air secondary air is going to be used for providing the heat power (compare Figure 3). Is it possible to distribute a heat power of 25 W/m² within the flat without any limitations on the comfort (especially temperature distribution)? The additional airflow (with a second ventilator) leads to an additional degree of freedom for the controlling of the system. Is it possible to control the temperature in different rooms of a flat with an air heating system (e.g. lower temperatures in sleeping rooms) without any limitations on the comfort (especially air quality)? The use of exhaust air leads to a different icing behaviour of the evaporator. The use of an additional ambient air changes this behaviour and a dependency on the control strategy can be obtained. The use of the speed-controlled compressor allows controlling the heat power and this again leads again to a different icing behaviour. Is it possible develop a prediction for the icing behaviour of the evaporator (with or without additional sensors) to increase the performance? Low ambient temperatures lead to low relative humidity in the room. An enthalpy exchanger can help to solve this problem, but the moisture exchange has to be controlled to avoid too high relative humidity in the room. A very common solution are enthalpy exchangers with a membrane but they have the big disadvantage, that they can be only controlled with the volume flow. How is it possible to control such a solution that it has still a high performance without risk of moisture damage? The use of secondary air (supply and ambient air) needs an accurate automatic balance control of the volume flows of supply and extract air. Which existing methods are reasonable for this application? The air-heating system concept does not include a storage, so the thermal mass of the system is limited to the mass of the components, which is very small and just indirectly to the thermal mass of the building. During a de-icing cycle, the supply air is no longer heated. What are the limitations belonging to the thermal comfort of this system? Has the higher heating power compared to other comparable systems an influence and what are possible solutions to get rid of this problem? The sum of this questions leads to a high effort for the control of the system (compare Figure 4). The combination of each of the controllable components leads to a high complexity of the overall system. To predict, realize and evaluate the correct and expected behaviour is the main challenge in such a development, the most important point is to find general solutions to solve this interdisciplinary problem. What are the main criteria to control such a system? How to standardize and optimize the control of such a system? How can the behaviour of the overall system be predicted in an accurate way? How can the correct behaviour of such a system be evaluated? For the state of the scientific knowledge, the whole research area for heat pumps has to be considered. A lot of review work was already done within the projects iNSPiRe (Universität Innsbruck, 10/2015-09/2016) and SaLüH! (Universität Innsbruck, 09/2015-08/2018) with main focus on system concepts of air heat pumps and their refrigerant cycle. There is quite a lot of ongoing work on the topic of extract air heat pumps. In this concept instead of a heat exchanger with a mechanical ventilation system, the extract air is used directly as source for a heat pump. Research and review work in the last years has been done by (Streicher, 2004) and (Afjei, 1999). The concept was proven (with all advantages and disadvantages) for example in (Höfler, ongoing). The development of compact units, also for cooling, started already in the 70ths with two patents: (USA Patent No. US3828575 A, 1973) and (USA Patent No. US4072187 A, 1976). In Europe (Bühring, 2001) developed a test rig and a dynamic model for compact units for Passive Houses, which was a very comprehensive work on this topic. The latest work were done by (Perers, Andersen, Furbo, Chen, & Tsouvalas, 2012), which was basically a measurement of a commercial compact unit. A lot of development was done by the industry on this topic, but few publications are available. 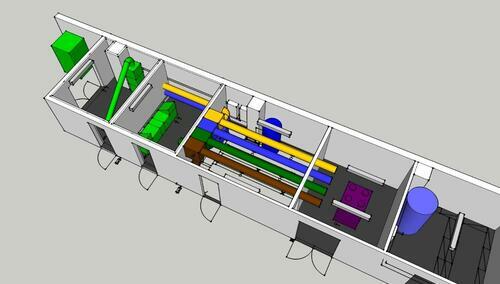 Modelling the heat pump is a main challenge of this work. There is a large amount of publications available, in present with focus on split units. A detailed literature review cannot be presented within this abstract, further work has to be carried out to find and develop suitable models for this application. An interesting work with a model of a mini air-to-air heat pump was presented in (Mortada S. , Zoughaib, Arzano-Daurelle, & Clodic, 2010). Further work promised in that publication (e.g. a prototype and measurements) was not carried out until now. Instead a dynamic model of this mini heat pump was developed in Modelica (Mortada S. , Zoughaib , Clodic , & Arzano-Daurelle, 2012). Air-heating systems are a wide spread field, not only including heating with the supply air, but also with secondary air. Fundamental review work was done in (Georges, Berner, & Mathisen, 2014) for air-heating systems in cold regions. Especially the limitation of the volume flow is a quintessence of this work. Actual works belonging air-heating systems in Austria were done in (Rojas, et al., 2015). Studies in comfort and temperature distribution of air-heating systems were shown in (Feist, Temperaturdifferenzierung in der Wohnung. Protokollband Nr. 25, 2004). They give an overview of possible approaches for known problems. The actual research area for exhaust air heat pumps has manageable amount. Within the EU project iNSPiRe (Universität Innsbruck, 10/2015-09/2016) a façade-integrated micro-heat pump with exhaust air was developed. The project SaLüH! (Universität Innsbruck, 09/2015-08/2018) and k-WP (Universität Innsbruck, 09/2015-08/2017) just started. Within that projects the work on exhaust air heat pumps will be continued. Belonging to the state of art a comprehensive market research was done within the project SaLüH! (Universität Innsbruck, 09/2015-08/2018). Heat pumps with secondary air had been developed but they have a heat power of more than 5 kW, which is not reasonable for a very energy efficient building or a small flat. The scientific research parts in those developments was rather small. Many controllers do not show the expected behaviour (Peper, Grove-Smith, & Feist, 2009) and no standardized testing methods are available. Figure 5 shows an overview of these parts and the subchapters. Within the projects SaLüH! (Universität Innsbruck, 09/2015-08/2018) and k-WP (Universität Innsbruck, 09/2015-08/2017) two exhaust air heat pumps will be developed. They will be measured within the Thesis in the compact unit test rig. A main part of this test rig (see Figure 6) is developed and constructed within this work and the mentioned projects. 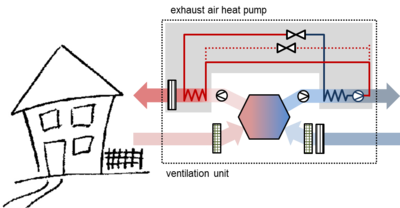 To prove the developed concepts and to develop a standardization belonging to the controllers of exhaust air heat pumps the so-called Hardware in the Loop (HiL) method is used. In the compact unit test rig a real hardware prototype will run and the boundary conditions (heat load of the house, temperature in the house) are delivered in real time of the simulations. With this method the concepts can be evaluated step-by-step without risking damage on the hardware and without the need of expensive demo buildings. Delivered for this web page on demand by the author.